Sylvia Liu Land: Pirate Picture Books! 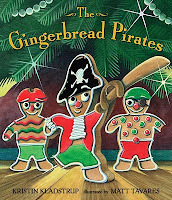 The Gingerbread Pirates, written by Kristin Kladstrup and illustrated by Matt Tavares (Candlewick 2009). 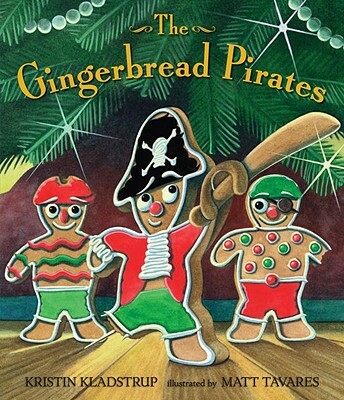 With a whole genre of gingerbread cookie picture books and another of pirate picture books, it was inevitable that a gingerbread cookie pirate story would be written. This is one of my favorites because it combines classic story themes (hero's quest, toy that wants to be real, Christmas magic) in original and heartwarming ways. The plucky hero, a gingerbread pirate, not only saves his crew from the evil cannibal in a red suit (Santa), but also achieves his dream of becoming a real toy to be loved (though being a pirate cookie looked awfully fun). The art nicely complements the text with its warm and soft tones, and the expressions on the cookies are priceless. The Legend of the Golden Snail, by Graeme Base (Abrams 2010). 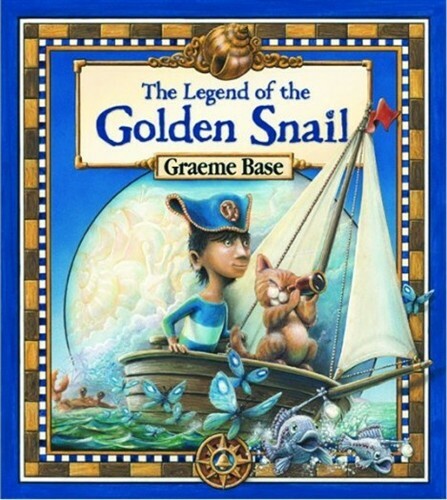 Though not actually a pirate tale, this story does involve a boy who wears a pirate hat and embarks on a fantastic sea adventure to find and tame the legendary Golden Snail. He also defeats earwig pirates who have commandeered lantern fish for their lights, among other adventures. Golden Snail is remniscent of David Wiesner's Flotsam, with beautifully drawn fantastical and dreamy sea creatures and scenery. When the boy finally finds the Golden Snail, he chooses to return it to its ancestral home, a satisfying ending. 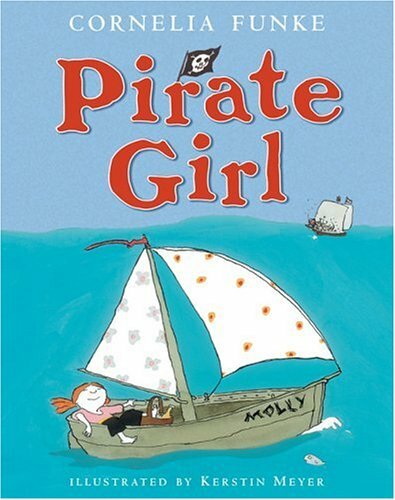 Pirate Girl, written by Cornelia Funk and illustrated by Kerstin Meyer (Scholastic 2003). In this girl power pirate story, a band of pirates captures Molly, a young girl who alarmingly refuses to play the docile captive. Though the pirates put her to work peeling potatoes, scrubbing the deck, and the like, they soon come to regret it when they discover Molly is the daughter of the most fearsome pirate of all, Barbarous Bertha. The illustrations are whimsical, cartoony, and loaded with funny details. 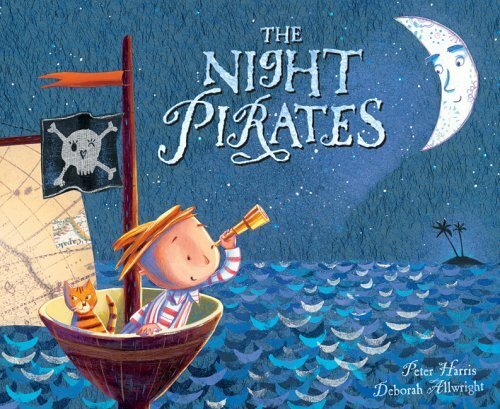 The Night Pirates, written by Peter Harris and illustrated by Deborah Allwright (Scholastic 2006) is a not-too-scary bedtime story perfect for younger kids. "Rough, tough little girl pirates" wake little Tom up, steal the front of his house for a disguise, and take him along on a pirate raid of some "rough, tough grown-up pirates." After scaring those pirates and taking their treasure, the girls deliver Tom safely back to bed. The illustrations, a combination of drawing, painting, and collage elements, are cute with a restrained European sensibility. The text is lively, alliterative, and nicely suited to being read aloud. 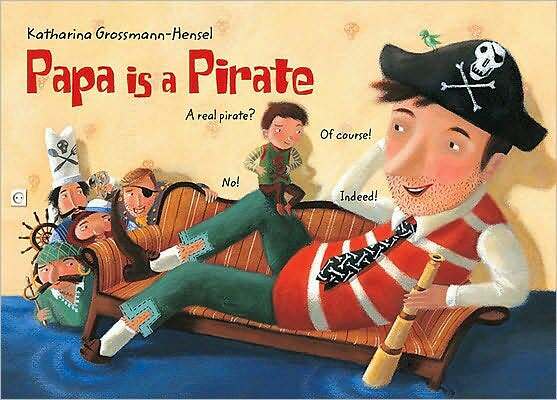 Papa is a Pirate, by Katharina Grossman-Hensel (North South Books, 2009) is a fun book. A little boy is surprised to learn that his dad's a pirate. He's skeptical, though, because the dad doesn't quite have the lingo down ("Turn left? turn right? Pirates say port and starboard, Papa! "), the right pet ("Pirates have parrots, not parakeets"), or the right story (his mom a pirate? "You told me before that Mom was a princess"). In the end, the dad convinces the boy, despite his delightfully silly stories. Hi Sylvia! Doing research for a 12X12 draft-- googled 'pirate picture books' and ended up here. Love your pirate picks! Hi Dana, glad you found this!